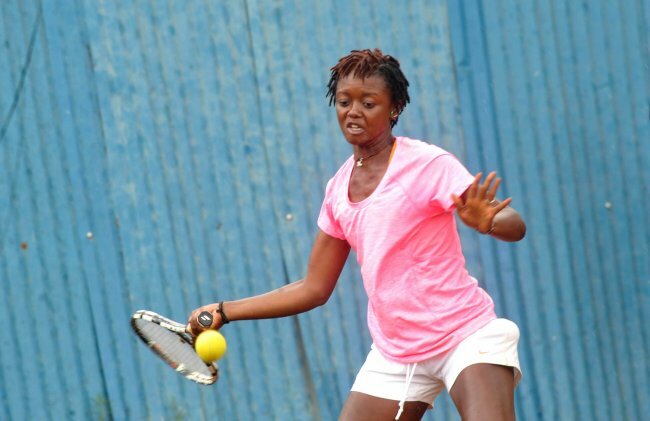 Siblings Ismael Changawa and Shufaa Changawa stormed to the quarterfinals as Kenya tennis players recorded mixed results in the morning session of day two of Africa Nations Cup played at Nairobi Club on Tuesday. Ismael, the top seeded Kenyan and Kenya Open champion, qualified for the quarterfinals after dispatching Democratic Republic of Congo’s Ivan Mamata 2-0 straight sets of 6-3, 7-5. Changawa made good of his promise by delivering good service balls for a 4-2 lead. It was however his vicious left forehand that proved too much for Mamata in the first set. Mamata came charging in the second set matching Changawa point for point as he stretched him to the limit. Changawa prevailed in the set 7-5 and took the match after a grueling one and a half hours. “It was a difficult match for me especially in the second set. I had to play to my best today. I improved on my service and return balls and that is how I was able to prevail,” the confident Changawa said after the match. Shufaa Changawa made light work of Marie Adomon from Ivory Coast in the women’s round of 16 clash to effectively qualify for the quarter finals. Changawa won in straight sets of 6-2, 6-1 in just 45 minutes of play. In other matches, promising Kenyan Petty Andanda lost 0-2 of 4-6, 1-6 to hard hitting Dennis Indondo from Democratic Republic of Congo. Andanda conceded early points due to poor service balls particularly in the second set. After easily beating Yorick Amon on Tuesday, it was end of the road for Kevin Cheruyoit as he succumbed to a 2-0 (3-6, 3-6) loss to Yassine Idmbarek from Morocco. The afternoon session will see Ismael team up with Ibrahim Yego for the men’s quarter final doubles as they take on Ethiopian duo of Abdella Nedim and Melkamu Sereche. Sheila Kotecha is paired with Cheruiyot as they face Mehdi Djadi and Mohammed Aziz from Tunisia.